Get ready to duck and cover. Because the fate of the planets rests squarely on Duck Dodgers - alias Daffy Duck - the fearless space crusader from the cartoon adventure series. Search secret chambers and caverns for mystery bonuses! Help Daffy shield himself from needles fired by crazed cactus! Block an onsalught of enemy space mines! Battle an undersea army of Instant Martians (just add water). Finally, look down the barrel of Marvin Martian's P-38 Space Modulator - with its destructive sights set on Earth! - 20 Levels of outer space adventure! - Looney Tunes characters in real cartoon animation! 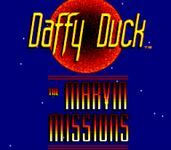 Daffy is in for an intergalactic blast. Because Marvin Martian is taking aim at the galaxy - and he's ready to ruffle a few feathers.